This is a reader’s book. Not a book for people who like reading but otherwise lead normal lives, but for people like me who define themselves by reading, whose lives are absorbed by reading, who would rather read than do (almost) anything else, and who love the idea of playing with the idea of the book itself. Now you have been able to reduce the countless embattled troops to an array that is, to be sure, very large but still calculable to a finite number; but this relative relief is then undermined by the ambush of the Books Read Long Ago Which Now It’s Time To Reread and the Books You’ve Always Pretended To Have Read and Now It’s Time To Sit Down and Really Read Them. Now admittedly he goes on to say that the arrangement of books on the shelves is chronological by acquisition and that this is ok because there are not so many that it makes finding a particular book difficult – which is clearly not an accurate representation of the state of affairs chez The Spouse et moi – but he is spot on about the way I shelve and reshelve, classify and reclassify every school holidays and yet within a fortnight the system has collapsed because the new acquisitions obstinately refuse to fit into the inadequate spaces assigned to them. Beyond the central idea of teasing the reader who must find out ‘what happens next’ with one inconclusive quest after another, there are many other ideas to amuse the keen reader: Calvino’s advice about being in the right mood to read (p8); faking reading (p30); total absorption in reading , reading all the time and everywhere (p140) and more. There is also Irnerio, a so-called artist placed into the book to upset us because he doesn’t read and likes books only to take them apart and make objects from them. 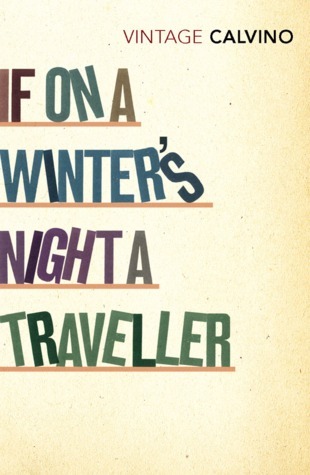 It’s true that you will almost certainly experience confusion and perhaps frustration while you’re reading If on a Winter’s Night a Traveller. It’s not that it’s hard to read (the translation is excellent) but you’ll probably finish it feeling quite uncertain about your own interpretation of it . This is partly because of the way you as reader (outside the text at home or on the train with your book) become entwined with the character in the book, the Reader addressed throughout the book as You. (This experience will be different for male/female readers because the You the Reader is a male, and a rather randy one at that). Calvino is playing with the way we readers tend to identify with the characters in books we read, and the way we ‘enter into’ the world of the book. I don’t think it matters if you find it confusing. It’s not stressfully confusing; it’s playfully confusing. It’s like James Joyce’s Ulysses in the way that it invites turning back to the beginning and reading it all over again for the delight in teasing out its riddles and the sheer exhiliration of the ride. There are some droll reviews of this book on Good Reads, almost as witty as Calvino himself even if imitating Calvino’s style is a gimmick done many times before. My favourites of these are by MJ Nicholls from Edinburgh and Yulia from New York but you won’t find them funny unless you’ve read the book, so save them till you have. Source: Personal library, purchased at Readings $12.95AUD. I so relate to the arrangement of the books. I can go from the strict library system to a totally random mess in the space of one weekend. Yes, those bits you quote are charming and endearing and very familiar. But when I read this book last year I found it pretentious and one of the most frustrating books I’ve ever had the displeasure of reading. The only reason I didn’t abandon it half-way through is because it was a book group read. John, I hope I can find reviews of his other books on your site, yes?? Kim, *chuckle* yes, it is a bit frustrating. But we’ll have to disagree about pretentious. I thought it was too funny for that. Books with books as their theme are always beguiling. I echo your opening paragraph. you write about this one so enthusiastically I have sent a sample chapter to my Kindle. This is fascinating, Tom – is it just the Kindle that’s made this move into cyberspace happen? Hi Lisa, I tried to read this a few years ago with BGL. I liked the classification of books that you highlight. Very good. But I stopped soon after that. Too confusing. Not playful. Just confusing. I guess I didn’t get the humour. This book is one of my favorite all-time reads. It introduced me to the genius and oeuvre of Calvino. Simply brilliant. What do you think I should read next by Calvino. Kinna? I recommend The Baron in the Trees. Thanks, Kinna, I’ve got that one…somewhere on the shelves. Where have I put it???? I read this book last year, enjoyed it, tried to review it… Oh well! I love your take, Lisa, which, besides bringing out the playful humour of the novel, also highlights aspects I had noticed and interpreted quite differently. Which just goes to show that Calvino has manged to cater for a whole spectrum of readers: an astonishingly versatile book. I like the sound of that title too. I wonder if it has anything to do with Shakespeare’s spiders?